I was very excited to try out this Waterpik Water Flosser for review! It retails around $50 give or take depending on the store. How it works, fill up the reservoir with water and the water shoots through to floss your teeth. There are a bunch of different heads to go on the flosser for different needs. For example, if you have braces, there is a special one for that. Did not give as good of a clean feeling as normal floss. Overall, I do like the water flosser a lot but would not rule out regular flossing. I would use the water flosser as a backup. 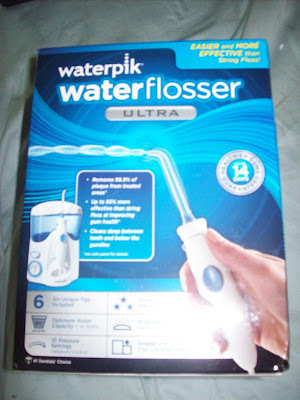 Thanks Waterpik for the new flosser!